Korea is one of my now favourite film-making countries. In over 16 years of viewing them, I'm struggling to remember a really bad Korean movie. Is it something in the water? Who knows, what I do know is this: they make damn great movies! 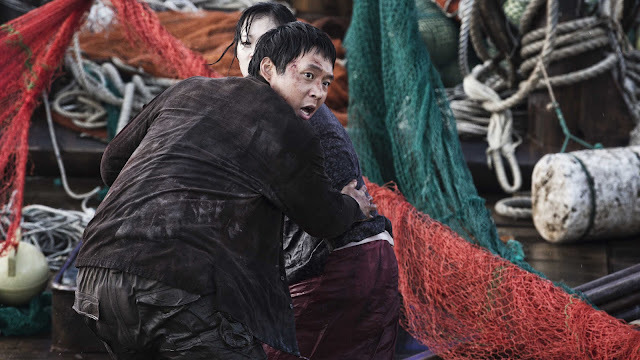 Haemoo is adapted from a 2007 stage play of the same name, but it is based on a factual incident that took place off the Southern Korean coast in 2001. Where the film differs wildly is the fates of both the human cargo and the crew. 25 Chinese-Korean's actually died, but another 35 survived, along with all of the crew. By depicting a far more grim scenario, Haemoo attempts to portray what happens to ordinarily level-headed humans who are put into intolerable situations which not only creates severely stressful environments, but also examines the mindsets which lead them to make their rash decisions, decisions of a magnitude they could never conceive of ever being placed in in the first place. What happens when greed, ignorance, and genuine raw fear generate a climate of major stress? The cast are all excellent, making their associated characters both believable and very human. The production design & sets creates a realistic view of life on a chaotic, dirty, aged and very ragged trawler that has clearly seen better days. Fist time director Shim Sung-Bo, ably supported by co-writer Bong Joon-ho (Director "Memories of Murder"/"The Host"/"Snowpiercer"), has fashioned a morality tale that resonates clearly in this day and age. Haemoo is by turns, dramatic, tense and gripping, successfully examining what can happen when an already difficult situation threatens to change into something beyond the comprehension of those involved.